Black and yellow full eye contacts providing an unbelievable effect on the eyes. 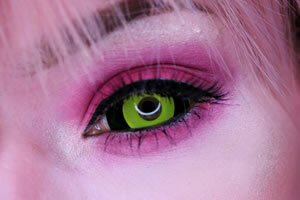 These black and yellow sclera contact lenses are a perfect addition to any costume or special effects makeup. ColourVue Sclera Angel Dust contacts are particularly popular among cosplayers and makeup artists, who use them as an amazing accessory completely changing the whole look and feel of their artwork. They are totally opaque and cover the whole sclera of the eyes, which means that they might be slightly more difficult to put in than regular contacts. This design of lenses might be useful if you're thinking about cosplaying Genos from One Punch Man or Mina Ashido from My Hero Academia. Order a pair now!